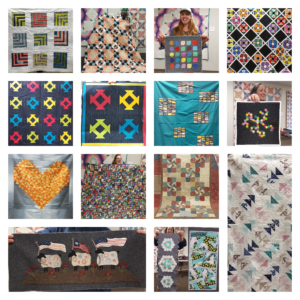 Hello quilty friends! April was yet another stellar show and tell. I’m always amazed at how productive and talented our members are. 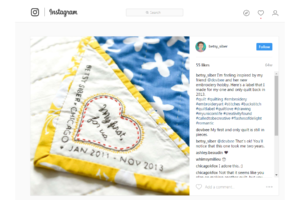 Loved this idea of stitching your quilt label into a corner of your binding. I also really liked the idea of creating a quilt block with your label and piecing it in your quilt backing. Have You Paid Your 2017 Dues? If not, go here. Looking to use up some of your stash? 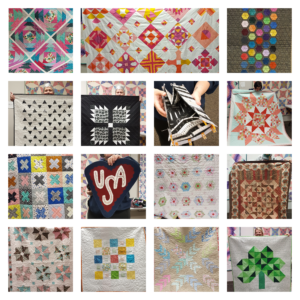 Want to make some fast, fun and easy blocks for our charity quilts this year? We have the perfect charity block solution – Scrappy Trip Around the World blocks! These blocks whip up in no time and each block only requires 6 – 2.5″ x 16″ strips of fabric. Follow this tutorial here. Quick Note: We’d like our blocks to have a solid black or dark gray center strip (which is the brown strip in the tutorial block). The challenge for 2017 is to make a quilted item (of any size or shape, it could even be a bag!) inspired by a piece of art. Select your artwork and use the Instagram hashtag #slmqgart2017 to share your progress or to see what we are up to! Next Saturday Sew Day – Saturday, May 13th from 10-3pm at Pine Needles (1100 W 7800 S #29, West Jordan, UT 84088). 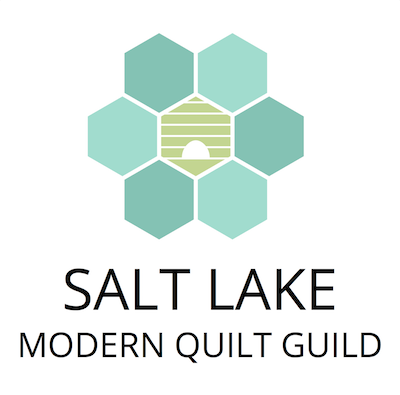 Next Guild Meeting – Thursday, May 18th from 7-9pm at the Handi Quilter building (501 N 400 W, North Salt Lake, UT 84054). Join us for the annual SLMQG Mini Swap! Bring a mini quilt (no side longer than 24″) wrapped/covered for a white elephant style extravaganza. Must be present and a paid guild member to participate. Las Vegas MQG + SLMQG Mini Swap – this summer/early fall. Let us know if you would like to participate. 2017 SLMQG Retreat – It’s going to happen this year! Mark your calendar: September 14-16, 2017, Bear Lake. The retreat is open to all SLMQG members. Join us for a stitch fun time!